Learn how to troubleshoot employee set up switching from QuickBooks Desktop to Online. If you've moved from QuickBooks Desktop to QuickBooks Online and you can't move on to the Taxes section in your employee set up section, it's likely because you need to inactivate an employee. We'll show you how to update your inactive employees, as well as active employees, so you can complete your payroll set up. If you are trying to set up QuickBooks Online and you can't move on to the Taxes section, it's likely because you need to inactivate an employee. Don't use this procedure if you plan to rehire the employee. Or have paid wages to them in the current calendar year. In the Employment section, choose Not on Payroll for an inactive employee. Select Continue to Taxes again in the pop-up window. 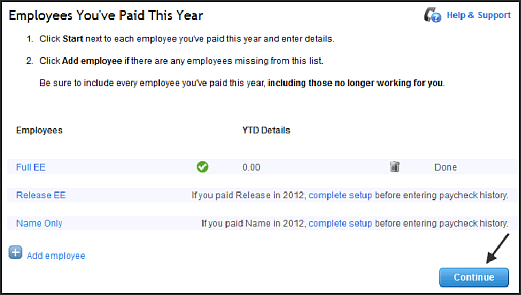 Complete Pay History for all employees paid this year. That should fix what was blocking your employee set up.